Were you not in doubt that with the no-confidence motion, it could have affected the post of Opposition Whip as well? A: Our Party is not on a political campaign that depends on minor posts and positions. If we wanted such positions and posts, we would not have engaged in politics like this either. The post of Opposition Whip has been granted not according to the combination in Parliament. We are prepared to give up that post at any time, if the combination changes. Then why is there an allegation directed at you, that the defeat of Prime Minister Ranil Wickremesinghe would have been disadvantageous to you? A: It is not relevant to us, who will sit in this chair. The reason it is irrelevant to us, that whoever takes this seat, whether it be Ranil Wickremesinghe, Maithripala Sirisena, or Mahinda Rajapaksa, who occupies this chair, it will be of no use to us. Since, if this is the economic policy that will be adhered to, and it is this shameless system of politics that will be continued and it is the same politicians who have made politics a business who are there it makes it pointless. Therefore, whether Ranil would remain or not in his chair was not an important factor for us. We voted against Ranil Wickremesinghe. Whatever happened, the JVP supported the no-confidence motion brought by the Rajapaksa group which has a label of corruption pasted on them? A: Supporting the no-confidence motion does not mean lining up with the Rajapaksas. It should be identified what exactly the line of division in politics in this country is. It is thought that the line of division in politics in our country should be that Ranil Wickremesinghe is in one camp, and Mahinda Rajapaksa is in another camp, which is the political divide that appears to be created. When you consider this division, the leaning of the Janatha Vimuthi Peramuna are being bent toward Ranil Wickremesinghe at one time; on another occasion toward Mahinda Rajapaksa. It happens due to the fault of this line of division. How would the people understand this actual line of division which you mention? A: The real division is that Ranil, Maithri and Mahinda are all on one side. The Janatha Vimukthi Peramuna is on the other side which is accountable to the people. Therefore every decision we make, how it affects Mahinda or Ranil Wickremesinghe is not relevant to us. Our main factor is how people-friendly our decisions are. Whatever allegations you direct against the Rajapaksa camp, do you accept the fact the decision made by them at this moment is correct? A: This is not a decision that was made with the intervention, instructions, or command of Mahinda Rajapaksa. When the no-confidence motion was handed over to the Speaker, the postures of Mahinda Rajapaksa and his son Namal Rajapaksa were fairly obvious. They did not speak up regarding the no-confidence motion at a time when it was being highly talked about and the fact that they did not make any statement in connection with their responsibility regarding it, showed that Rajapaksa was not giving his blessing to this at all. Two camps were created during this no-confidence motion. One was the Basil Camp. The other was the Gotabhaya ‘piles’ gang. Here, there were two political requirements. Basil Rajapaksa thought that entering into a deal with Ranil Wickremesinghe will help him escape from the frauds and corruption he has been involved in. Gotabhaya’s gang thought that by defeating Ranil Wickremesinghe they could set up a coalition government with President Maithripala Sirisena and get his corrupt activities swept under the carpet. It was with these requirements that this no-confidence motion was brought. Are you indirectly trying to point out that this no-confidence motion was not necessary at this moment of time? A: No, whatever the objectives of this no-confidence motion was, the ties Ranil Wickremesinghe has with the Treasury Bond Fraud of the Central Bank and his responsibility was taken into consideration by the JVP and only then did they use the vote against it. At the same time, we pointed out one by one, during the debate the other accusations against him. Even though the no-confidence motion was brought against the Prime Minister, and once again the allegation targeting you during the debate was that when ¼ were attacking Ranil Wickremesinghe, ¾ attacked the Rajapaksa camp. A: The first thing is what our stance was. We voted against Ranil Wickremesinghe in the no-confidence and engaged in defeating him. That was the most important decision of the no-confidence motion. We made that decision. However, this no-confidence motion was brought against a single individual and twisted against a group of individuals? A: What we pointed out through expressing all these views was that Ranil Wickremesinghe is not suitable to hold the post of Prime Minister not only because of the Treasury Bond Fraud. Our entire story showed the strategies he used to protect the relations with the politicians in the administrations in reality, the strategy he engaged in to try and divide the Sri Lanka Freedom Party failing. Therefore we mention the Rajapaksa gang. We did that because Ranil Wickremesinghe did not take any action against them. We recalled Rajapaksa and attacked Ranil Wickremesinghe. Did you not have a fear that if the JVP was not in favour of this, there would be a powerful backlash from the people as well as from within Parliament? The decision on the no-confidence motion against Ranil Wickremesinghe was influenced based on our policies and decisions. Every decision of ours is based on our policies. It could appear as if we went against Ranil. At other times, it could appear as if we supported him. It could also appear at some other time that we either supported Mahinda or opposed him too. We will not be suppressed by the definitions being made by those ‘parrots.’ All our decisions are made so that they accountable to the people. We will not be brought down by the definitions of the parrots. We make all our decisions with responsibility to society. Twelve of the fourteen points in the no-confidence motion were relevant to the Treasury Bond fraud but is it because this transaction was approved that the Prime Minister is not defeated during this? A: There are two objectives. One is that there was a political game within this no-confidence motion. On one side, the Gotabaya gang could have got rid of Ranil Wickremesinghe and built up an administration where they could have got ministerial posts. I say with responsibility that they discussed this for two months to obtain ministerial posts in the Government. Similarly, Maithripala Sirisena wanted rid himself of Ranil Wickremesinghe and appoint a Prime Minister who could be tamed by him in order to bolster his power further. This political requirement was embedded in this no-confidence motion. However, that political requirement was defeated. However, Ranil Wickremesinghe has not been released from the facts included in the no-confidence motion. The reason is that the Parliament is not a place where cases are heard. Therefore defining that he was freed from the ties and responsibilities he has in connection with the Treasury Bond fraud through the no-confidence motion is completely wrong. However this immature, garrulous “piles” gang which talks without any purpose, has built up a foundation that Ranil Wickremesinghe has been freed from the Treasury Bond fraud allegations. Wimal Weerawansa stated that if the ‘peacock notes’ did not exchange hands here and there during this no-confidence motion Ranil Wickremesinghe would have been sent home. He is well aware of his bosom friends in politics. There are those around him who can be bought for money and they hold discussions with those who can be bought for money, so what other objective is there regarding politics? He seems like an infant who did not know up to now that there were politics where Parliamentarians could be bought, and sold for money! Until this no-confidence motion was brought he engaged in expressing nonsense and he is a person with a mental disease, to say that if the no-confidence motion was not won, the sun would not rise the next day, which he pointed out through his media. Therefore, due to that mental disease he became the one who shouldered the no-confidence motion. Today when he has no answers he is unable to do anything. But he says the Government lost its two-thirds majority in Parliament? A: Did the Government have a two-thirds majority? They did not have such power. Actually did ‘peacocks’ change hands? A: Anything could have happened. It could have been said that they would be freed from their court cases. They could have said they would file cases too. Some could have joined this to escape from their court cases. Such things could have happened to gain victory in the no-confidence motion. Could it happen? Has it happened? According to your understanding. A: It could definitely happen within these politics. At the same time, the group who tried very hard to ensure victory in the no-confidence motion also wanted to obtain ministerial posts and other positions and to be released from their court cases. In both these camps, ‘peacocks,’ court cases, crimes, posts and positions could have been the mode of trade. Can you directly target Ministers such as Palitha Range Bandara, Wasantha Senanayake and Wijeyadasa Rajapakshe with this allegation? A: What we have to simply tell the people what a soiled and dirty, shameless group these politicians are. What we are asking the people is should we hand over the responsibilities of the country to such a shameless group? What they have is not a policy. Their political criterion is how big a piece of meat they will receive on their own plates! So, does that mean that the entire no-confidence motion was used to mislead the people? A: Very clearly; all three groups of Maithri, Ranil and Mahinda did that. They deceived the people politically, continuously. It was the same this time, too. Is it true that inside Parliament, Prime Minister Wickremesinghe and Anura Dissanayake exchange notes on pieces of paper? What is the basis for this? A: Groups which have no knowledge about the JVP or the politics of the JVP and are unable to defeat our views think that it is possible to overthrow the JVP by complaining and reproaching the JVP leaders and the Party. Those are not truths but just rebukes. It was only the JVP who continuously brought up allegations against the Prime Minister and proved them. If there is such a doubt I request you to listen to the debate once again. 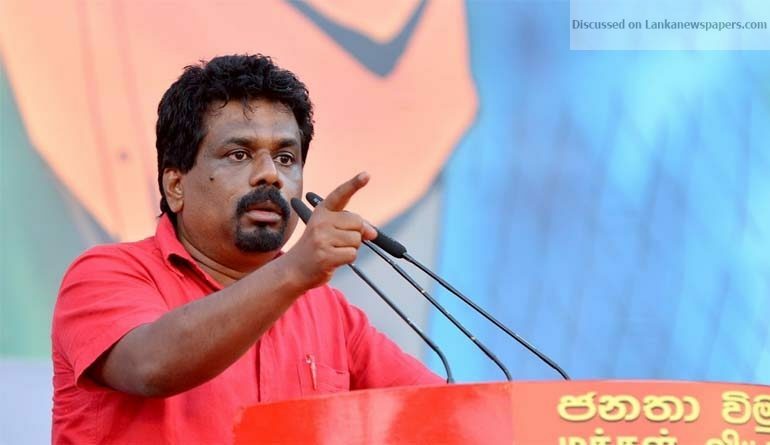 While some people pulled Ranil Wickremesinghe by the ear and others pulled him by the hand, the JVP took up the entire politics of Ranil Wickremesinghe and criticized him. Using your language, is this no-confidence motion the end of just another drama? A: This is the end of a very comic, humourous, distorted performance. People are not being taught political lessons within a peaceful political environment. This incident was also confirmed through things that the people would not be able to understand even if they read a number of books.